The air distributor normally consists of a series of pilot valves, one for each cylinder arranged radially around a cam. Timed to the engine and driven from the camshaft, the distributor opens the main air start valves in the correct sequence. 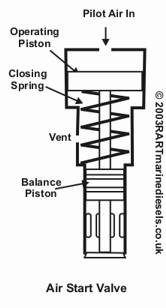 The air start valve is located in the cylinder head. When it is opened by the air signal from the distributor, compressed air at 30 bar flows into the cylinder, forcing the piston down. 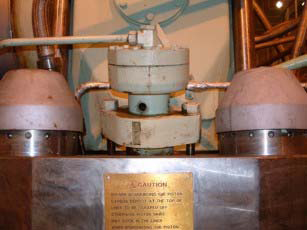 The connection to each air start valve is fitted with a protection device. This can be either a flame trap or a bursting disk. 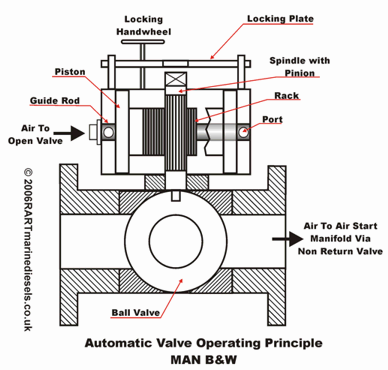 The automatic valve is only open whilst an air start is taking place. It incorporates a non return valve to prevent any explosion in the air start system getting back to the air receivers. 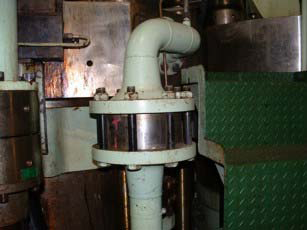 A slow turn valve is incorporated in the smaller bore pipework to the side of the valve. This is used to turn the engine slowly before starting, to prevent damage which could be caused if liquid had found it’s way into the cylinder. The valve shown in the photos and the diagram opposite is from an MAN B&W slow speed two stroke. The valve itself is a simple ball valve which is turned through 90° by pneumatic actuator. 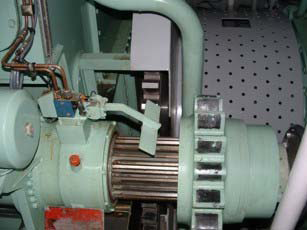 The actuator consists of a central spindle with gear teeth machined onto it. This is rotated by two racks which are driven by pistons. 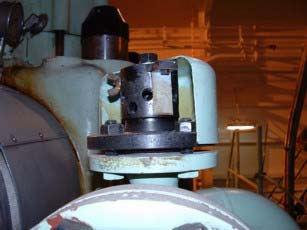 When a start signal is given, the space behind the pistons is pressurized and they move together, rotating the spindle and opening the ball valve. At the end of the start sequence air is admitted through the second guide rod (not shown) pressurizing the space between the pistons, moving them apart and closing the valve. The turning gear interlock is a control valve which will not allow starting air to operate the system when the turning gear is engaged. 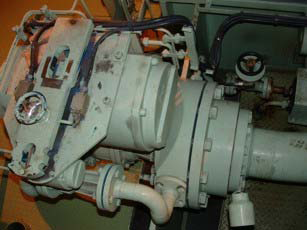 Two air start receivers are fitted. 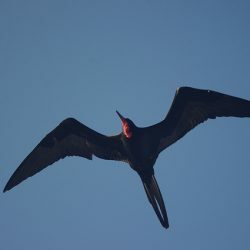 The total capacity of the receivers must be sufficient to start the engine 12 times alternating between ahead and astern without recharging the receivers. 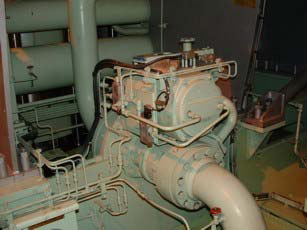 In the case of a unidirectional engine, then the capacity must be sufficient for 6 starts. The air receiver will be fitted with a relief valve to limit the pressure rise to 10% of design pressure. A pressure gauge and a drain must also be fitted. 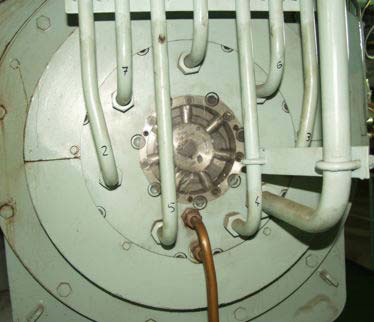 A manhole gives access to the receiver for inspection purposes. 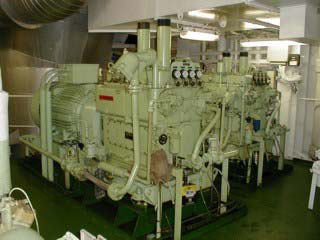 Two air start compressors are normally supplied which must be capable of charging the air receivers from empty to full in one hour. 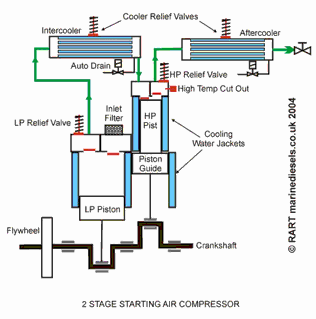 They are usually two stage reciprocating with inter and after stage cooling. Relief valves will be fitted to each stage which will limit the pressure rise to 10% of design pressure, and a high temperature cut out or fusible plug to limit the HP discharge to 121°C. 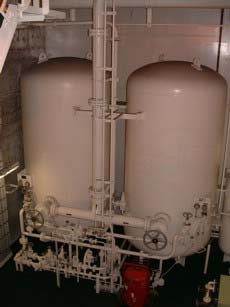 Inter coolers are also fitted with bursting disks or relief valves on the water side.